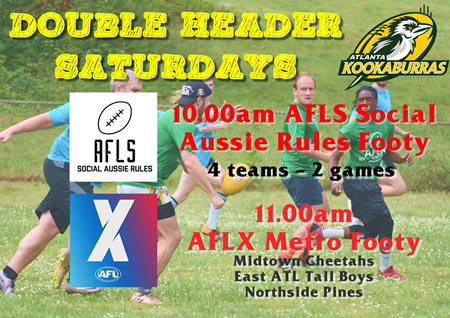 The Atlanta Kookaburras are pleased to now introduce AFLX Metro Aussie Rules Football games following their AFLS Social games on Saturday mornings. The addition of AFLX games provides extra opportunities for players to sharpen their skills and knowledge towards full scale USAFL Kookaburras games commencing in July. Players enjoyed the AFLX draft night Thursday night where three new teams were formed from the player list. East Atlanta Tall Boys, Midtown Cheetahs and Northside Pines leaders selected their teams carefully to form teams that will play round robin games each Saturday morning. These games are fully sanctioned USAFL Metro games with official scores retained, rosters posted and official umpiring conducted from a modified AFLX rule book. Want to play AFLS social games of AFLX Metro tackle games? You can simply sign up here. Games commence each Saturday at 10.00 am. The Atlanta Kookaburras welcome everyone to join us and celebrate as we start a brand new AFLX - Atlanta Metro Aussie Rules Football Season.The Kookaburras with AFLX are aiming to continue increasing their footprint in the Atlanta sporting landscape. With the ongoing development of our AFLS Social Aussie Rules Football games, we see the AFLX games as a significant step forward before the Kookaburras start their true USAFL season in mid July. This Thursday night 7.30pm at The Midway Pub players will be drafted into three newly branded AFLX teams, Northside Pines, Midtown Cheetahs and the East Atlanta Tallboys. Team leaders will draft players in pairs or trios, with one experienced player and one or two new to the game players.This will ensure the new teams will be evenly balanced and every new player will have more experienced and seasoned players to guide them. When: Thursday May 17th at 7.30pm. On Offer: Some appetizers or snacks at no cost. Drinks at regular prices. 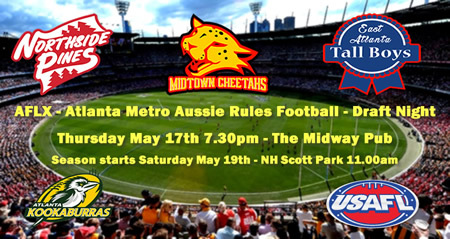 Season #2 of AFLS, Social Aussie Rules Football, kicks off here in Atlanta this coming Saturday May 5th with a "Come and try free" day. The game is Co-ed and just like Aussie Rules Football but with no tackling or contact by players, so is completely safe for men and women of all ages to play. So if you would like to join a bunch of fun people, maybe get a little fitter in a friendly game environment, then this is the game for you. The games at N.H.Scott Park, Tilson Rd Decatur, will be played Saturday mornings from 10.00am. The season itself comprises of 7 weeks of games, with a free wicking t-shirt, drinks and snacks at games and socializing afterwards. It truly is a great way to stay active and make great new friendships. The first AFLS season here in Atlanta was a huge success no matter which way you look at it. Taking on the challenge to open up our game of Aussie Rules Football to as many people as possible, for a continual Social Co-ed league, the Kookaburras designed and organized AFLS season 1 after taking input from many areas. 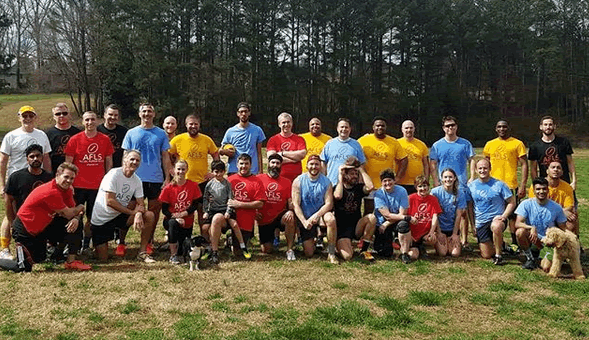 The AFLS game no tackle version of the game, named after the Australian Football League and the Social component of the game, was trialed in Atlanta over 5 weekends from November to January. The Kookaburras took on much of the advice, comments and Ausball rules ratified by other team leaders around the USAFL, mainly from Baltimore and Sacramento. The Kookaburras would like to thank those who's advice contributed to our success. Finding a field were we could play 2 games simultaneously was a huge win, enabling four teams to play concurrent games, a streamlined set up, organization and later socializing aspect, was a big win. 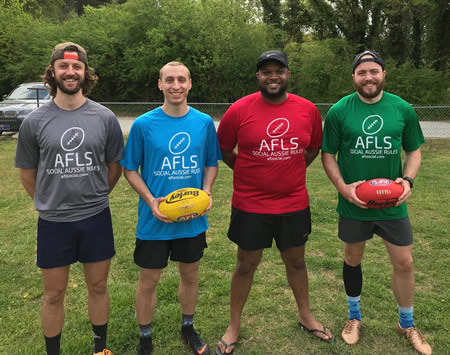 Through the trial games and Season 1 there have been 50 players take part in the AFLS games so far, with more than half getting a taste of Aussie Rules football for the first time, in a friendly social setting. With the finals of Season 1 to occur on April 14th after a short Easter break, Season 2 will roll out on May 5th with a "Come and Try Free" day. If you want to get active, meet some great new people, AFLS is the game for you. Our participants ranged from 20 years old to 60 years young, proving that it really is a game for everyone.